So mine arrived very quickly. And I am chuffed for £20. It has joined my display of special editions at work. I have so many dust magnets in my man cave I stop going in there now! Heat for the deal though - weird that no game is included? Only had a quick look at it at my office but it was a good size and detailed. Worth every moment of game play over this last year &amp; a saving when compared actual therapy. The ones being sold by Amazon have sold out which it why the link isn't working. Good deal while it lasted OP! New yes, pre-owned? Not so much. 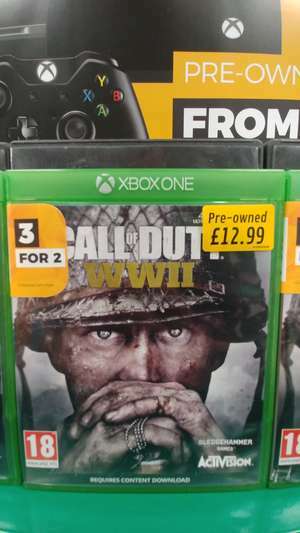 £13 for a fairly recent cod is a decent price, is it not? Seems like a decent price, why all the cold votes? Works out £8.66 each if there were another two games you were interested in. That's not too bad. Which serious “bank” will have a single alphabhet as logo. I have written to my MP bringing this to their attention. Hope they crackdown on such scams. Yeah mate it got removed, it was comedy gold. Why is digital always so much more expensive than physical? It makes no sense to me. That is worth max. £10. It’s worth noting you can pick up the standard version from PSN Indonesia for £10 in current sale. To be honest Ubisoft always get stick, but imagine where we'd be without Siege?? And everything else they've released this Gen. Love Wildlands, just wish the map was a little more compressed. Paid £20 for it and worth every penny. It's a great game, not as good a story as the first one, but still a great game. Looking forward to the new one coming out. Never miss a 'Call of Duty: WW2' deal again! Yeah, you're totally right, you hero. You must feel so good about yourself just about now. Good thing this site isnt full of people like yourself who do not contribute. what was the original deal then? While apparently £19.99, local Game at Mansfield had a few copies stickered up at £15. Note eBay copies are going for £18 so thought worth sharing. Cheers. It’s been £15 in CEX for weeks... Edit: that’s pre-owned actually sorry! "a nice new crisp box n non scratched disc is worth a tenner." If that's the case why would I pay £28.99 and £3.99 for delivery or am I missing something? Going for around £12 on ebay-used. Seems to be the cheapest everywhere, brand new it is still £22.99. Only a few left in stock though! Was 13.99 3 days ago. Thanks for the link. Just a shame the website is total garbage. Click the link to go back to the same page. Well wait for our to become available on a site which is even remotely usable. Available until 18/06/18. Apologies if this has been posted before, I searched before posting but did not find it. Yeah the online multiplayer is really bad but it's still got a brilliant campaign, best since ghosts and definitely worth getting to play though if world war 2 is your thing. Don't think cod will ever go away as it's too much of a money spinner and the new black ops has battle royal mode so I'm sure the masses will be playing it again. The deluxe version is currently available for 55 quid which includes all map packs past and present if you want to play online. Nope :( black ops 3 was the last to support 4 player split screen which btw is free for ps+ users right now. Had a look there and added both bundles, which brings it to £449. Then add Tom Clancy's Rainbow Six Siege Currency pack 600 Rainbow credits DIGITAL CARDS (Digital Download Code for £3.99 to bring it above £450 and use the £50 voucher code to bring it back down to £402.99. Only seems to work for click and collect once SoD bundle is in the basket though so SoT seem to be messing it up still even though its showing as in stock. No issues with delivery with Overwatch bundle no its own, but not as much of a bargain as it was at £391 yesterday. Looks like State of Decay 2 is back in stock, but the Console/COD/Overwatch bundle only knocks £61 off now, instead of the £84 from yesterday. Can't even get this any more as State Of Decay 2 is not available on the site. I can't even bring myself to buying one . so I'm waiting for a one x glitch that will beat john lewis one. I'll buy once it hits 10pound. Rather play the new God of war instead. I played the beta too, didn't feel enough to buy it, still doesn't even at this cheap price. Oh amazon gave me a £5 credit . Least rated something . Think it’s time to give up on this...don’t think anything else can be done . Least some people got the deals so it’s not all bad . 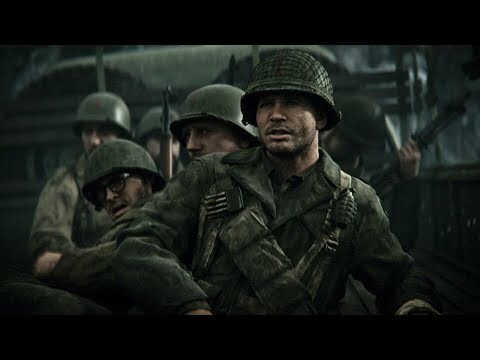 Call of Duty: WWII is a first person shooter that was released by Activision on November 3, 2017, for Microsoft Windows PCs, the Xbox One, and the PS4. 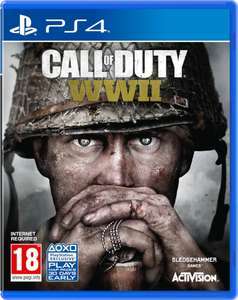 It is the 14th game in the Call of Duty series and the fifth in the Call of Duty World War II sub-collection. 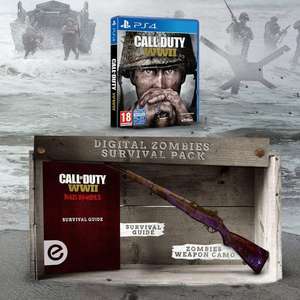 The game traces the story of an infantry battalion which lands on the French beaches during D-Day in 1944, although multiplayer modes open up other battle environments and provide the chance to fight Nazi zombies as well. So, let's have a look at what it has to offer in a bit more depth and find out whether it's the right addition to your gaming collection. Call of Duty has become a legendary gaming franchise, allowing players to immerse themselves in some of the bloodiest episodes of human history and to play the hero or battle strangers in online multiplayer arenas. It's come a long way since debuting in 2003. Let's take a very quick look back at some of the landmark titles in the series to put Call of Duty: WWII into context. Call of Duty – The very first COD title appeared in 2003, developed by Infinity Ward and published by Activision for Microsoft Windows, PS3 and Xbox 360 consoles. Lacking a multiplayer option at this stage, the game took players through three WW2-themed campaigns, with Soviet, British and American characters. Needless to say, it was a massive hit. Call of Duty 2 and 3 – The sequels to COD emerged in 2005 and 2006, and both dealt with World War II (so don't be confused here: the current title is the fourth Call of Duty game to deal with WWII). Treyarch took over for COD: 3, as Polish, French and Canadian episodes were added. Crucially, both of them also feature a variety of multiplayer modes, with death matches, headquarters and Capture the Flag all available. Call of Duty: Modern Warfare – Activision chose to diverge the COD series away from WWII with the fourth Call of Duty game (entitled “Modern Warfare”). This time around, the designers created present-day themed environments and campaigns, with some futuristic elements thrown in. When the third Modern Warfare instalment arrived in 2011, Sledgehammer had been brought in to tighten up the mechanics, and they remain at the helm of the whole project. Call of Duty: Black Ops – At the same time that Modern Warfare developed, Activision also launched the Black Ops series (starting with the fifth COD title, “World at War” released in 2008. Four stealth-centred Black Ops titles have followed since then (not developed by Sledgehammer). Call of Duty: Infinite Warfare – Infinite Warfare appeared in 2016, making it the most recent Call of Duty game other than WWII. As with “Advanced Warfare”, it's a science-fiction based shooter in the classic COD mould. Again, it's not a Sledgehammer creation, being the work of Infinity Ward, and has been a huge success for Xbox One, PlayStation 4, and Windows PCs. As you can see, the Call of Duty franchise has become a sprawling hodge-podge of warfare-based titles, ranging across modern history and into the future, and featuring three teams of developers. The thing to remember as far as Duty WWII goes is that it's the fifth World War II-based title in the franchise. So, if you want to trace the arc of its development, try to find copies of the original three games and Call of Duty: World at War. You'll see that the graphics, combat system, control, campaigns, and multiplayer have come on in leaps and bounds. For the leading gaming site IGN, the game is fast-paced, exciting and, in parts, powerful, with a solid multi-player mode and improved graphics and add-ons like the Nazi zombie arena. Meanwhile, Trusted Reviews reported that they “couldn't remember the last time that a Call of Duty felt this exciting” and gave a big thumbs up to the graphics and immersive gameplay. 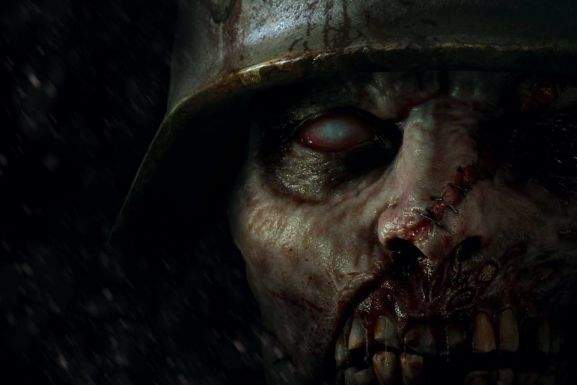 As you can imagine, the creators Sledgehammer could have approached World War II and the Holocaust (which plays a role towards the end of the campaign) in a tasteless, brainless way. But they have treated the subject matter with delicacy and maturity, resulting in a grown-up title that still has the kind of adrenaline-rush and fast pace that modern gamers demand. Not an easy feat. What New Features Does Call of Duty: WWII Bring to the Action? 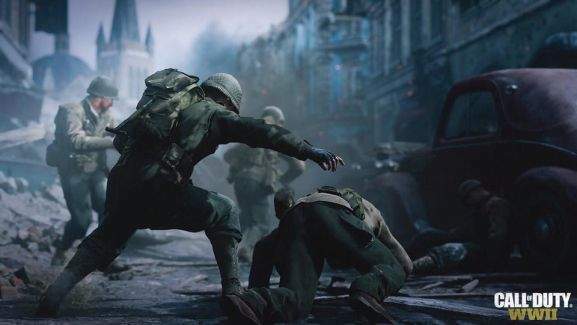 Many commentators have noted that at its core, Call of Duty: WWII is an effort to return to the mechanics and feel that made the original Call of Duty games so popular. So in a sense, the game doesn't set out to offer anything revolutionary. However, having said that, the graphics are exceptional - crisper and more realistic than any previous title in the entire franchise. For instance, as you trudge through the woods of Normandy, you get a sense of the difficult, muddy terrain, and the hostile weather. In keeping with the expansion of console and computer power, the game's melees are also more satisfying and larger than ever before, with more hostile vehicles and soldiers to encounter (and more allies as well). Older elements have been re-introduced, such as the need to carefully ration the use of health packs during firefights, while the action in general seems to have a more “human” scale, with a sense of fragility and danger that some war-based FPS titles lack. And there's also a strong sense of teamwork, even in one-player campaign mode. Sledgehammer have tried to create an authentic infantry squad mechanic, with the need to keep all team members charged up and healthy. As various team-mates have essential skills like medical assistance, ammo supply, and calling air support, this really matters in the heat of the battle. Having said all of that, it's also a familiar title, and the changes aren't radical. So, if you have played any Call of Duty before, you'll hit the ground (or the beach) running. The gameplay in Call of Duty: WWII has two major modes: Campaign or Single Player and Multiplayer. Campaign mode sees you take the role of Ronald “Red” Daniels, member of an infantry battalion as it fights across France, and into Germany, encountering all kinds of scraps along the way, and participating in real-life events like the Battle of the Bulge. As we noted above, to succeed, you'll need to keep your whole squad healthy, which means picking up health packs where you can find them. You'll also need to upgrade your squad's abilities. To do so, players have to achieve “heroic actions” like capturing enemies or saving allied soldiers. As you do so, squad members will start to develop their key skills, like identifying enemies from a distance or healing their fellow soldiers. As with many games, at the start of the campaign, you and your fellow soldiers are fairly under-powered, and under-skilled, motivating players to get involved and to keep unlocking abilities. In Multiplayer mode, you get to choose one of five divisions: airborne, mounted, armored, expeditionary, or infantry, which corresponds to different categories of weapon, in classic multiplayer FPS style. They then start at the bottom of the division, and earn “perks” to level up, gaining access to better weapons. Everything works via a feature called “Headquarters”, where players receive orders from computerised superiors. As they complete the tasks required, they earn “Supply Drops”, which give the whole division enhanced capabilities. HQ is also the place to launch one-on-one matches, start Zombie wars, or even play older titles in the Activision collection – providing a vast number of different gameplay challenges which appear on an ongoing basis. So, whenever you log on, there should be tasks to complete and enemies to battle. Call of Duty: WWII has been released for Microsoft Windows PC, Xbox One and PS4, so make sure you purchase the right version for your gaming system. Unfortunately for PS3 and Xbox 360, Mac or Nintendo Switch users, Activision won't be bringing out versions for them to play. Digital Deluxe Edition – Comes with the Call of Duty: WWII download as well as a complementary Season Pass, and a whole host of bonus content. Digital Standard Edition – Comes with the Call of Duty: WWII download, and that's pretty much it. You'll be able to play the Campaign mode without any issues, but if you want to access multiplayer, a pass will be required. Standard Edition – The COD: WWII game delivered in a hard case in DVD format – a neat option for people who like to have the hard copy next to them when they start playing a brand new title. Pro Edition – One for experts and collectors, the Pro Edition comes with a Season Pass, the game, extra bonus content, and a Steel Book, as well as a more attractive, larger case. Unsurprisingly, the Standard download edition is usually the cheapest, followed by the hard copy Standard edition, then the Digital Deluxe, and Pro Editions, but prices vary depending on where you make your purchase, so shop around. And, along with those editions, you can also buy Season Passes separately. Passes are required to gain access to the multiplayer Headquarters, and are generally more expensive to buy as standalone products compared with the cost of bundles that include them. However, if you hunt around on HotUKDeals, you may well find Season Pass deals that make buying the Standard Edition and a pass a more cost effective option, so don't assume that bundles are better. Finally, it's worth noting that some Xbox One and PS4 Pro bundles include Call of Duty: WWII as the centrepiece of their packages. So, if you need to upgrade your gaming system, and want the latest FPS shooter on the block, they could be the perfect purchase to choose. Are There Any Essential Gaming Accessories to Use with Call of Duty: WWII? If you intend to seriously master the multiplayer modes on COD:WWII, beefing up your gaming accessories collection could be essential. If so, HotUKDeals has plenty of offers on specialist gaming mice from brands like Logitech or SteelSeries, as well as comfortable gaming chairs from big names like X-Rocker and Brazen. There's also quite a lot of Call of Duty: WWII merchandise around, allowing players to enhance their experience as they fight across France. Products available include infantry division hoodies from Destination-G, as well as dog tag bottle openers and military pins. 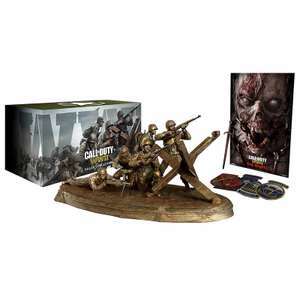 If you're looking for a stocking filler or small birthday gift for COD fans, merchandise is always a good way to go. Are There Any Extensions Available for COD: WWII? As Duty WWII only came out in early November 2017, there hasn't been much scope to add extensions as yet, but Activision are preparing to launch a completely new map pack in the near future, so stay tuned. Subtitled “The Resistance”, it will no doubt place players in the role of partisans across the WWII theatre. Aside from that, we've already discussed Season Passes, which can be bought from merchants like Steam, the PlayStation Network, GAME, and the Microsoft Store. Generally, these passes also unlock extra content, including Zombie maps, more real-world maps, and extra missions for one-player action as well. The game will e. g. receive a bonus map, called Carentan, at launch. If you want to hep liberate Europe from the Nazi menace, now is the time to do so. Call of Duty:WWII has hit stores across the UK, and there are plenty of ways to find it for much less than the asking price. The best way to snag a Call of Duty bargain is to compare prices across the UK using the HotUKDeals product finder. In seconds, you can call up prices from merchants like Argos, Amazon, Co-operative, Tesco Direct, Very, Currys, the Microsoft Store,Morrisons, ShopTo, and GAME – allowing you to pick one that doesn't break the bank. However, if you are willing to hold out for a while, you can expect the price to fall considerably. Video game prices plunge a few months after release, and there's no shortage of other FPS games (like Destiny 2 or Assassin's Creed: Empire) to try. So, bargain hunting blaster fans could wait for January Sales, the Black Friday, Cyber Monday or even Amazon Prime Day in the summer to start the campaign. Bargain hunting doesn't end after you've purchased the game, either. When DLC content arrives in the coming months, expect to find it for less at HotUKDeals, and when you need a Season Pass, there's no better place to look. Always destined to be one of the most eagerly awaited games of 2017, Call of Duty: WWII seems to have delivered on all fronts. Take control of a soldier as he slogs from the beaches of D-Day to the liberation of Berlin, or join thrilling multiplayer battles and help your division achieve military immortality. Either way, the best Call of Duty: WWII deals are all at HotUKDeals.